On October 8 at Gurgaon in India, members gathered for the first Okinawa kenjinkai in India. On October 8, nine people from Okinawa established the “India Okinawa Kenjinkai” in India, where there was previously kenjinkai group. At “the First India Okinawa Kenjinkai,” which was held in Gurgaon, near Delhi, the Kenjinkai members pledged to embody Uchinanchu spirits of “Ichariba chode,” “Yuimaru,” and “Bankoku shinryo” and to promote and preserve Okinawan culture in India. Momoyo Nakazato from Urasoe City, who is a teacher, was appointed as president. Members include Yasushi Shinzato, who is also a teacher, and his family members Isono, Koharu, and Etsu from Naha City, Yumeno Higa from Kitanakagusuku, who works at a government organization, Kanefumi Kina from Naha City, who works in manufacturing, Naoki Fukuda from Nagasaki Prefecture, who lived in Miyakojima City for two years, and Ayako Ueno from Kagoshima Prefecture, who has a brother living in Okinawa. In India, where Japanese business has been successful, other prefectures have set up kenjinkai and have been actively engaged in group activities. 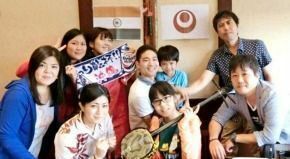 When Nakazato was thinking of setting up an Okinawa kenjinkai, she connected with Kina, who will participate in the Sixth Worldwide Uchinanchu Festival from India, and made contacts with Okinawans dotted around India.